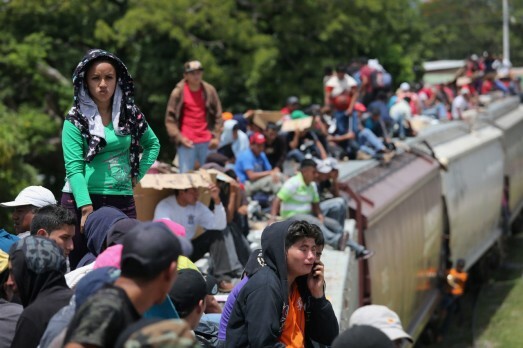 Every year hundreds of thousands of Central American migrants ride freight trains up through Mexico in the hope of reaching the United States. They are riding ‘The Beast’ or ‘The Train of Death’. The nicknames give you some idea of how dangerous it is. The danger is not only in jumping on and off moving trains, but in the humans they meet: immigration police, soldiers, local and federal police, all of whom can be counted on to be corrupt and violent to varying degrees. Parts of the route are also controlled by violent criminal gangs, probably supplementing their drug-running income. But the people keep coming, driven not just by dreams of life in the US, but by the poverty and violence they are escaping in their home countries. In Mexico City I met Andrea, a small, smiling lecturer in philosophy. She works with an organisation called Ustedes Somos Nosotros (You Are We), a collective of students and teachers who organised a refuge for migrants where trains pass the edge of Mexico City. The refuge provided food, medical aid and advice to the train riders. But in 2013 a combination of illegal raids by authorities and threats from gangs in the area of the refuge, who naturally didn’t want anyone helping their victims, became such a cause for concern that the refuge had to close. For some time the collective continued offering help by making regular visits to the area with supplies. Until the end of last year, when two of the people they worked with were shot dead by one of the gangs. For the moment the collective has no presence at the railside. It doesn’t seem to occur to her to stop the project altogether. Andrea lives in a nice flat in a good part of town. She has a stable teaching job at Mexico’s best university. She could probably go her whole life without having dealings with the criminal gangs whose activities determine the lives of millions of Mexicans. Except the police that is: she has plenty of experience of them, particularly from a nine-month strike at the university when she was a student, eventually broken by the police illegally entering the main occupied space and arresting everyone they could get hold of. Andrea smiles as she explains she was at a party with a friend, having decided to skip most of the long assembly happening that night. She speaks with a similar lightness when she explains that because of her human rights work she is entitled to a certain level of state protection. “It doesn’t work,” she says with a shrug. She doesn’t dwell on this, instead returning to a description of the deadly obstacle course the migrants must run on their way through Mexico. Many of them will survive the ordeal only to be caught at the US border, or die in the crossing. The European equivalent is the crossing of the Mediterranean, similarly controlled by unscrupulous gangs. Those Death Voyages are, if anything, even more dangerous, but without fixed routes it seems difficult to help, except perhaps when a few of the migrants reach Calais. Andrea continues to plan her return to the railside, to give what help she can to the riders of the Train of Death. Next Post: 1000 years without great pyramids: the Mayans’ greatest achievement?